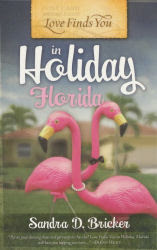 About the Book: Lawyer Cassie Constantine has no plans to stay in Florida. She's here just long enough to sell her late husbands vacation house, a tacky bungalow she's always despised then she'll hightail it back to her gracious Boston brownstone. But the place needs more work than Cassie bargained for. What's more, her widow status is like a target on her back and the elderly matchmakers around town manage to sidetrack her mission at every turn. Holiday is a landmine of golf tournaments, ballroom dancing competitions, shuffleboard and day trips. But the biggest obstacle of all? Richard Dillon, the stuffed shirt she's paired with on the dance floor. Cassie had always considered herself uptight but Richard won't take a walk on the beach without his socks and shoes! There's one little problem he makes her heart beat faster than the rhythm of the quickstep. Can Cassie and Richard let loose long enough to have a little fun?